Subtitles are now available also in French. Many thanks to Delia for the translation. If you would like to be part of the team by making the movie available in your language... just get in touch and we'll tell you how it works. I would like to let everyone know that Matthias Jahn died on 16th of August 2009 at the age of 54 after illness. Matthias recorded the vocals of Crossroads in his home studio with us and made one of the remixes. 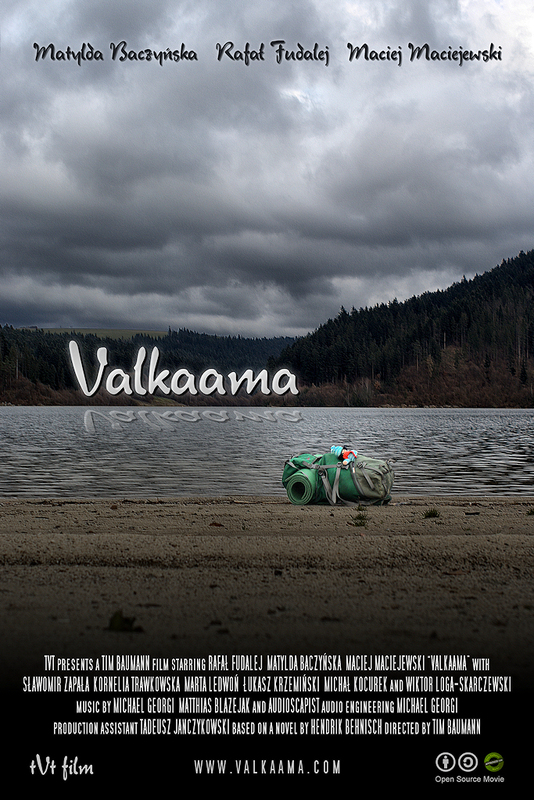 With added music, opening sequence and credits Valkaama now is a complete movie and hence the first Open Source feature film. In order for you to see the result of the last three months efforts you can watch and download the current version of the movie here. Although the movie is complete it is still tagged as Beta. The reason for this is that like in (Open Source) software development improvements are still possible. For Valkaama this means that the current music score will be improved and that even two new scores are being created. If you want to check out the ongoing work on the music please visit our YouTube page. An important part of what the whole Open Source Movie thing is all about is to enable others to use the material we produce for their own purposes. And one really great example for such a usage of Valkaama is West Latta's tutorial on how to make a film score on audio tuts+. So let's shortly analyse why an Open Source Movie like Valkaama which uses an OS compatible license such as the Creative Commons by-sa is needed for people like West to safely use external clips in order to do such great stuff as film score tutorials. Liberal licenses like the Creative Commons licenses you can apply in order to give others the freedom to use your own creative work within a safe legal framework. The license hereby clearly states the DO's and DON'Ts when it comes to handling the material. So why is an Open Source compatible Creative Commons license the best choice? As you probably know there are 6 standard CC licenses which consist of one ore more of the following modules or conditions: by (Attribution), nc (Noncommercial), nd (NoDerivs) and sa (ShareAlike). If you now make some research you will quickly find out that most of the few free movies you can find on the web are using the condition nd, and almost all of them the condition nc. So why is that counterproductive for people like West? And furthermore, why he couldn't make his tutorial without access to the movie's sources? First of all free movies licensed under nd conditions don't allow you to make any modifications to the material. Hence they are useless for any reuse, remix or mashup and... no tutorials with these. Second of all, the nc module is quite a trap. On the webpage West's tutorial is published it is possible to gain access to premium content (source files, bonus tutorials and more) by paying a monthly fee. Although this particular tutorial which uses scenes from Valkaama is freely accessible the fact that it is also offered within a commercial framework clearly infringes the nc term. The same applies to the small commercials displayed on the webpage. Well, so much for the licenses... As for the sources, why exactly are they needed? The reason for this is quite simple, yet important: the source tracks containing the dialogues can be downloaded separately from our FTP Server. Since they aren't mixed with music yet, you can simply add another film score without having to separate voice and music before. A task which is nearly impossible by the way. Note: This version of scene 56 still has some color grading issues we're trying to fix in the forthcoming BETA of Valkaama. The English subtitles of Valkaama can be downloaded now. Hopefully other language versions will follow by the help of people who like our movie and our free culture project. If you want to make subtitles in a different language you can use simple programs like Subtitle Workshop or others. All you need is the current Alpha 2 version of the movie and the English subtitle file which already contains the timings of the dialogues. Apart from the subtitles the script of the movie is now also available as a PDF file in English and German. Get it at the Sources page. Update (23.05.2009): German subtitles are available. Update (16.06.2009): Polish subtitles are available. Am 2. April habe ich auf der Re:publica '09 einen Vortrag über Open Source Filme gehalten. Eine schöne Zusammenfassung davon gibt es auf der Webseite des t3n Magazines. Die Vortragsfolien könnt ihr hier ansehen und vielleicht kann ich noch ein Video dazu auftreiben, da einer der Konferenzteilnehmer seine Videokamera dabei hatte und die Präsentation aufgezeichnet hat.